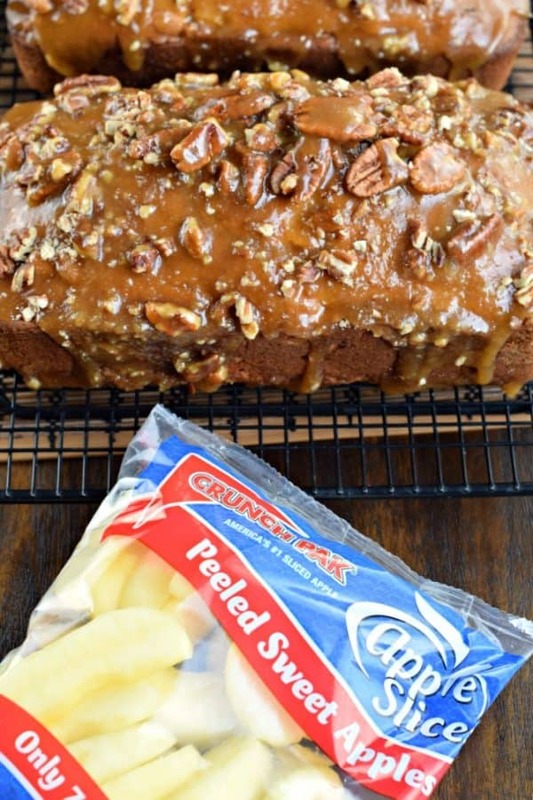 Sweet and comforting, this Praline Topped Apple Bread is the perfect start to your day! 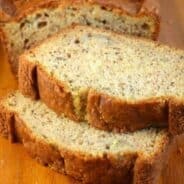 Recipe makes two loaves, and freezes well too! My house has very drafty windows. It’s on our list of things to replace by the end of 2017, but until then we freeze in the winter and sweat in the summer. One way to combat the crazy cold house, besides blasting the furnace, is to bake. The heat from the oven fills the whole first floor…and of course the scent of apple and cinnamon fills the entire house. And when it comes to making quick bread recipes, well, this ain’t my first rodeo. One thing I love to do is make sure that my bread recipe will yield TWO loaves. I mean, if I’m going to go through the effort of baking bread…I want enough for my family to enjoy for a couple days. Or, at the very least, be able to freeze a loaf of bread to enjoy at a later date. 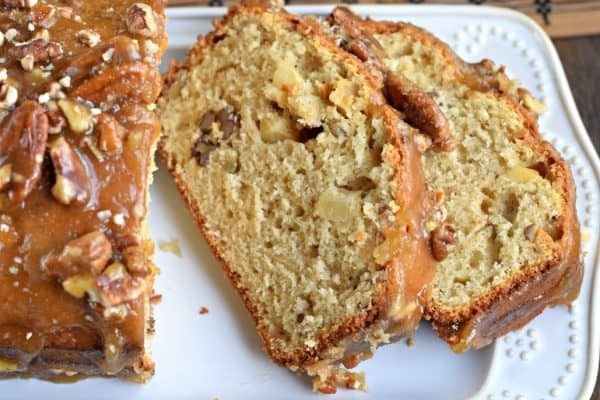 Today’s Praline Topped Apple Bread recipe will allow for you to freeze the bread, however, once thawed, the praline topping doesn’t look as pretty (still tastes wonderful though). 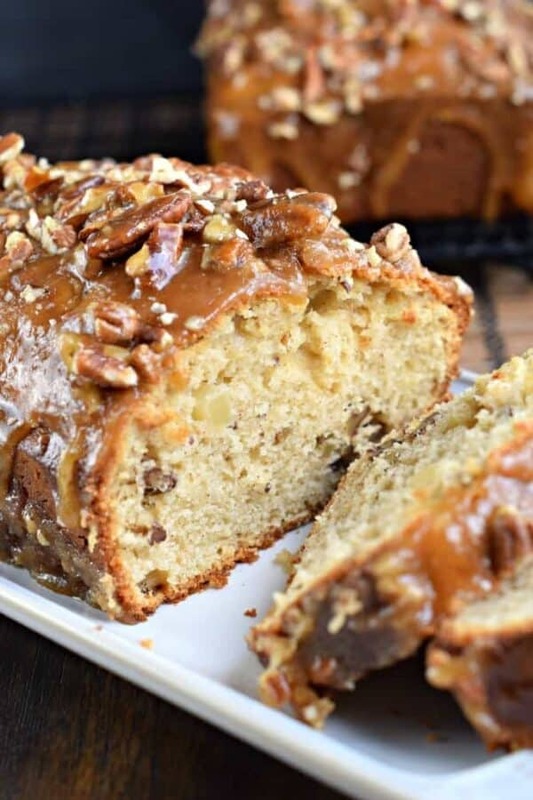 If looks matter to you, you can freeze the bread BEFORE making the topping, and make a fresh batch of praline topping for your thawed loaf of bread (if you’re only making praline for one loaf, just halve the recipe, it’s crazy easy to make). 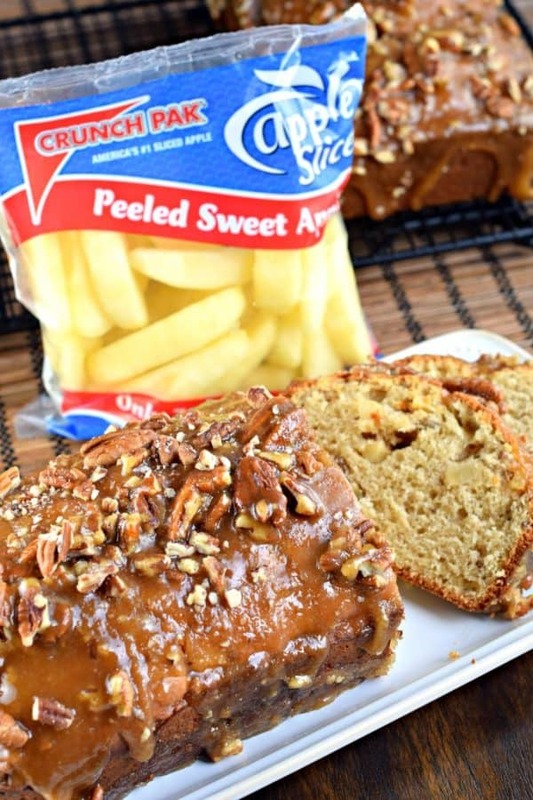 Another shortcut I love is to use Crunch Pak apple slices! Not only do they make the individual snack bags, which are perfect for lunches or on the go athletes like my family…but they also make bags of sliced apples. That are already peeled. And they don’t taste chemical-like AT ALL. 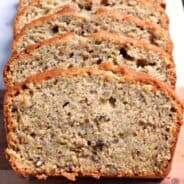 Prepare your bread pans by spraying them with baking spray AND lining the bottom with a small piece of parchment paper. Nobody wants their bread to stick to the bottom and be ruined, this extra step guarantees they will come out perfect! Make sure you dice your peeled apples into thumbnail sized pieces, and your pecans too! 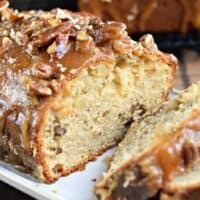 For the glaze, once you’ve boiled the brown sugar and butter, spoon small amounts over your bread then sprinkle with pecans. Repeat several layers until all the glaze is used! Once the glaze hardens, wrap in foil and keep at room temperature until ready to serve! ENJOY! Preheat oven to 350°F. Spray two loaf pans with baking spray and line the bottom with parchment paper. Set aside. In a large mixing bowl combine butter and sugar for the bread. Beat until combined. Add in eggs, almond extract and vanilla. Mix until combined. Add in flour, baking soda, baking powder, salt, and cinnamon. Slowly add in sour cream. Batter will be thick. Fold in apples and pecans. Divide batter evenly between the two loaf pans. Bake for 60-65 minutes, until toothpick comes out clean. Cool in pans 10 minutes, then remove and cool on wire rack, completely, before adding the glaze. For the glaze, heat butter and brown sugar in small saucepan over medium high heat. Bring to a rolling boil, stirring continuously, and boil for 1 full minute. Spoon small amounts of the glaze over the bread and sprinkle with pecans. Repeat several times until all the glaze and nuts are used. Allow to set (about 30 minutes). Wrap up for freshness and store at room temperature. ENJOY! This looks so decadent and delish.. and I WANT IT! PS. I also love the tip to spray the pan AND add a layer on the bottom of parchment. So smart… and totally doing that next time! Would it be bad if I made an extra batch of the glaze to slurp down? Holy yum! I am in love with this bread! 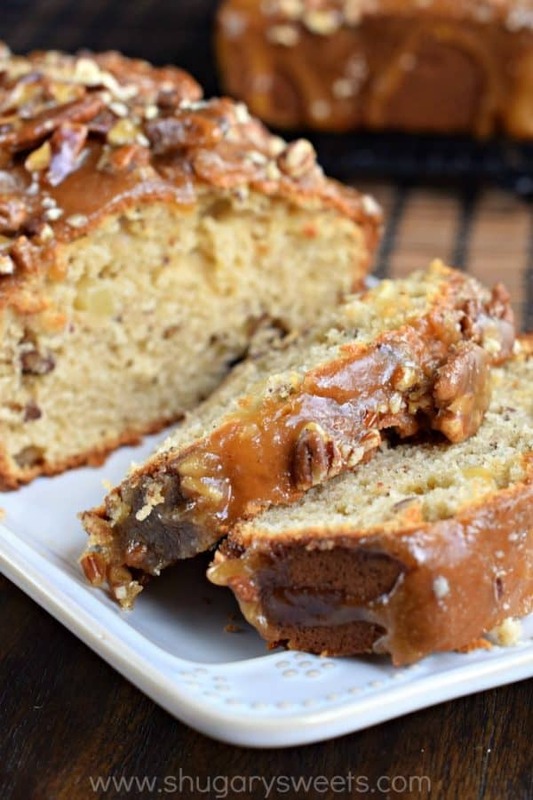 That praline topping looks incredible! Love that this makes two loaves. We’d go through one loaf way too quickly! 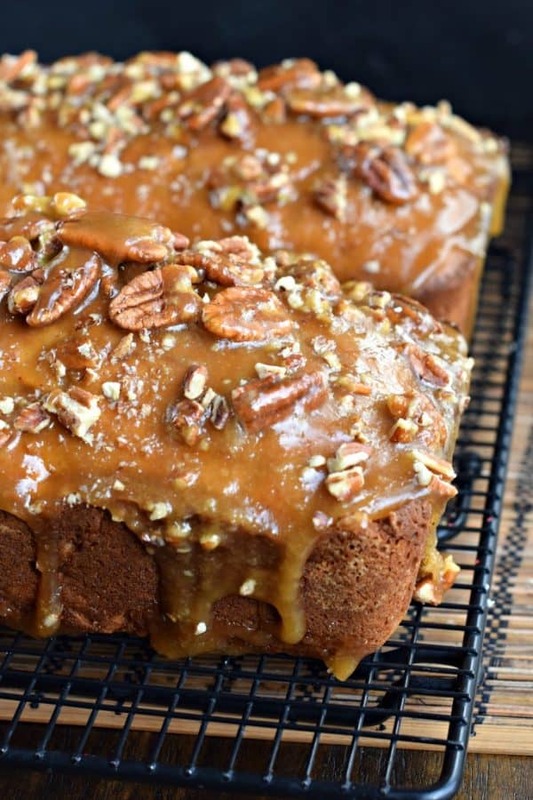 You had me at “praline-topped”. I mean, jeez, could this look and sound any more delicious? Convenient that this recipe makes 2, because I’d need one whole one for me and one for James. Unless of course I got to his first. What a great recipe! I love that glaze, and can only image how fab this would be with a cup of coffee! Apples and cinnamon are one of my favorite things. Looks yummy!! YUM! How decadent! I’m pretty sure my friends wouldn’t mind helping me eat an extra loaf of this bread! 1) I toasted the pecans first. 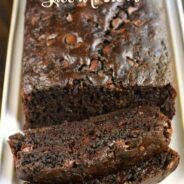 2) I poked holes in the tops of the cooked loaves before spooning on the praline topping, to let the topping penetrate a little. 3) The cooking time shown is way too long at 60 – 65 minutes. I baked the loaves for 50 minutes and they were much browner than I would have liked — I would have taken them out sooner, had I thought it necessary to check them sooner than 50 minutes. The bread was dry. I see similar recipes online that call for 50 minutes cooking time. Overall disappointing.